At first, I had no idea how to use this weird consistency product. Many people complained how messy and time consuming the application is. I don't think it was a problem for me, it takes time to get use to it, but it's not a big deal. 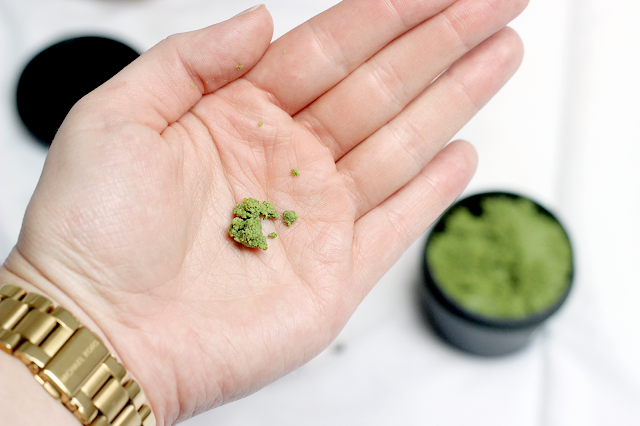 I would get a small amount of product in to the palm of my hand, add a little bit of water and rub, until it turns in to milky green paste. Then gently rub in to my face. After I washed it all off my skin felt silky smooth and super clean. 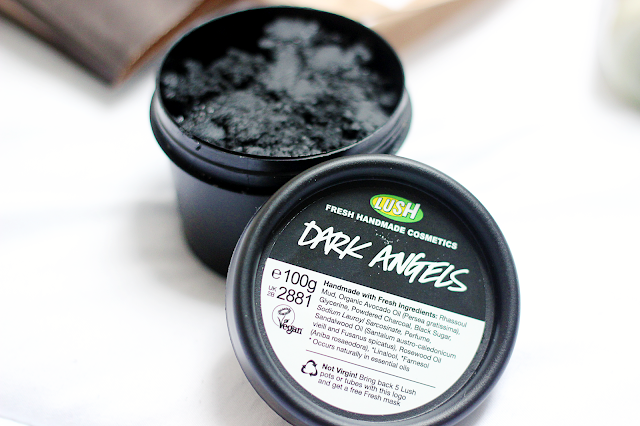 So being very satisfied customer, I went back to Lush store, maybe on the third day and bought DARK ANGELS. 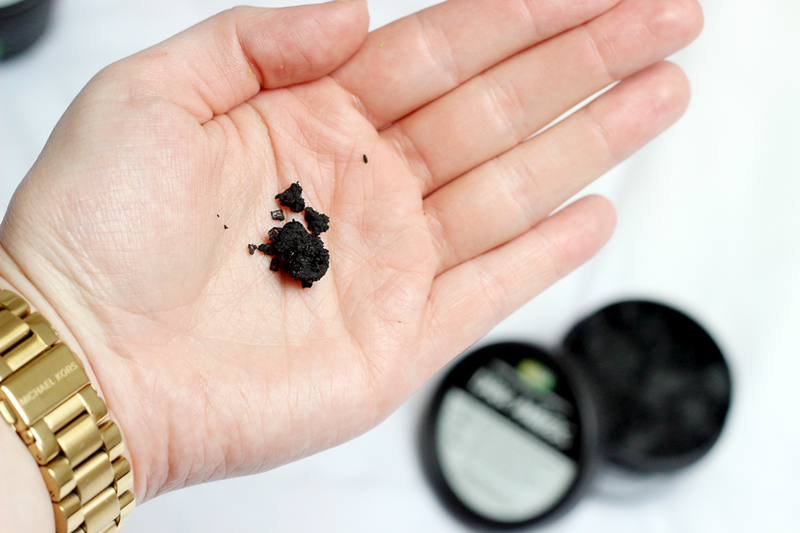 This cleanser contains rhassoul mud, organic avocado oil, powdered charcoal, black sugar, sandalwood oil, rosewood oil, etc. Black sugar and powdered mud makes great exfoliator, so you won't need any other scrubs. Now, this thing is messy. And when I say messy I mean it. Charcoal and mud... Errrrrm, need I say more? First application, literally, freaked me out. I was like Oh my god, how am I gonna wash it all off?! But it was just me overreacting, as always... It washes off easily. 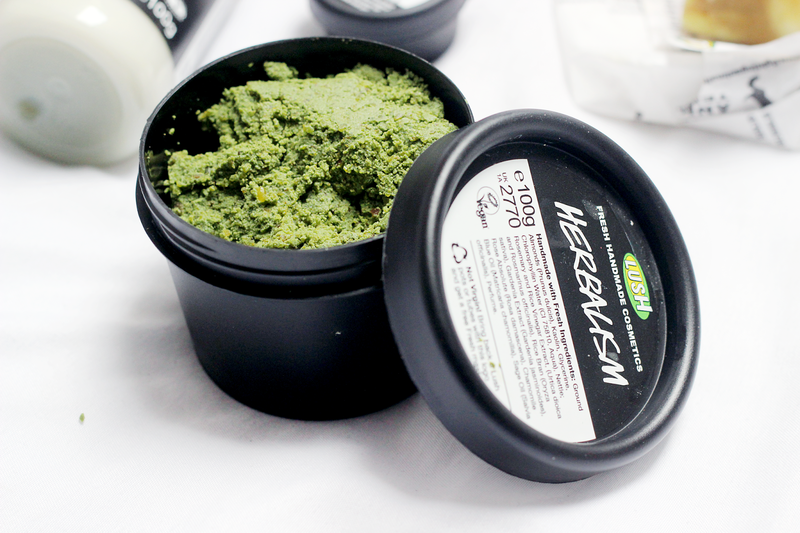 The consistensty is similar to Herbalism, but a little bit firmer. You can play with the texture, depending how thick or runny you want it. I would apply few drops of water and make thicker paste because I like using this as a mask too. I apply it all over my face and leave it for a bit, then lightly massage my face and wash it off. I would use both of the cleansers daily, sometimes once and sometimes twice a day if I have extra time to mess around. I was BLOWN AWAY by the results after using it for just two weeks. My skin never looked better and spot free. Herbalism helped A LOT with my blemishes and redness and Dark Angels worked wonders on spots and my oily T-zone. My skin always feels extremely soft after every application and the best thing is - I don't get that tightening feeling on my skin after I come out the shower. Both products retails for 6.75/100g which might sound pricey, but these tiny pots lasted me for about 2 months. I purchased second pot of Herbalism, unfortunately Dark angels was out of stock that day, but I am definitely repurchasing it. My skin is not in the best condition at the moment after very bad experience with one of the new concealers ( you can read it here), so I need to get back in the game with these two bad boys and fight those nasty spots! Overall, I love both of these products and I will keep repurchasing it because it helped my skin a lot. Let me know if you tried it and please recommend your favorite face cleansers! Oh I'm glad you said they were good! I also heard they were super messy.